The Camry has been a class-leader for years; however, Toyota is never content to let the best mid-size sedan on the road rest on its laurels. That’s why for 2016 it has received an extensive face lift that updates both its exterior and interior. A large spindle-style grille is the first change one notices when looking at the new Camry. While this update was largely decided upon for aesthetic reasons, as it reflects the industry wide trend toward wider fascias, but without indulging in the garishness seen on some models, it was also carried out to improve airflow to the Camry’s engine, which, as with the 2015 models, is either the standard 2.5L DOHC I4 that generates 178 hp, an uprated 3.5L DOHC V6 that turns out an impressive 268 hp, or, on the Camry Hybrid, a 156 hp 2.4L DOCH I4 that is paired with a 105 kW permanent magnet AC synchronous electric motor. Beyond the 2016 Camry’s fascia, other external changes include restyled running lights and, on the Special Edition trim, smoked taillights, 18-inch wheels, and a moonroof. While these and other updates give the new Camry a look that sets it at the forefront of the mid-size sedan segment, it is perhaps the adjustments that have been crafted into the car’s interior that drivers will appreciate the most. Among them are front sport seats, with Ultrasuede® seats available, improved Optitron instrumentation that adds both a competitive feel and crispness to the remodeled cockpit control panel, and a variety of interior surfacing options, including silver interior trim and leather-covered control surfaces. Infotech systems have been tweaked, as well, as an optional wireless recharger that’s mounted near the gear-shifted enables phones to be recharged without having to be plugged in, while the 2016 Camry XLE and XSE trims now feature seven-inch screens that are an improvement over the previous 6.1 inch units. These models also come complete with enhanced sport and luxury features, including a power moonroof, acoustic noise-reducing windshield, push-button starter system, and Entune™ Premium Audio with Integrated Navigation and App Suite. The Entune™ Premium Audio system, in particular, is set to be a major hit with drivers, as it incorporates an AM/FM CD player, MP3/WMA playback capability, six speakers, auxiliary audio jacks, USB 2.0 port with iPod®connectivity and control, advanced voice recognition, hands-free phone capability and music streaming via Bluetooth® technology, Siri® Eyes Free, and HD predictive traffic with Doppler weather overlay, among other features, in one multimedia bundle. In terms of performance, the new 2016 Toyota Camry maintains the fuel efficient spirit of its predecessors, as the Ultra Low Emission Vehicle II (ULEV-II) can hit 25 MPG city, 35 highway, while the Camry Hybrid attains an excellent 39 MPG city, 41 highway. 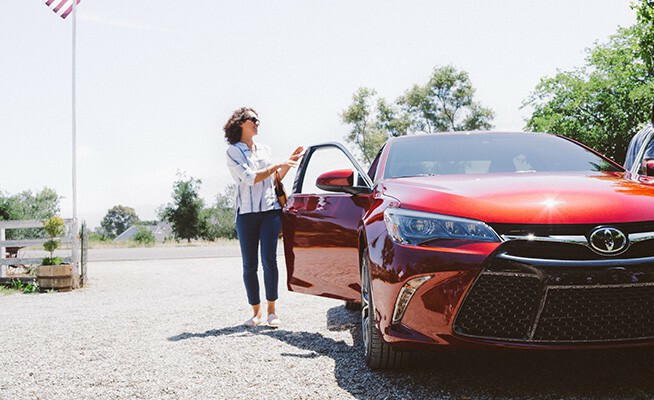 Given the starting MSRP of $23,070 on the Camry LE, with the premium XLE and XSE editions beginning at only $26,310, these stats mean that this attractive mid-sized sedan is one of the most impressive values on the road. Ultimately, the best way to learn about the 2016 Camry’s new features is to try them out yourself. Call Elmhurst Toyota’s sales professionals at 630-279-2160 to schedule a test drive, or feel free to simply stop by our lot at 440 W. Lake Street in Elmhurst to see the models we currently have in stock. Given our special incentives and rebates, we’re sure you’ll find a new 2016 Toyota Camry that fits your budget and needs at Elmhurst Toyota.